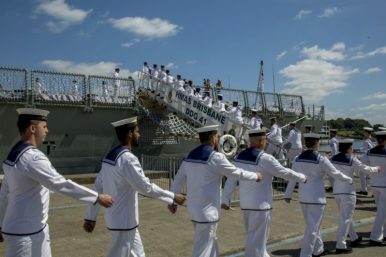 The Royal Australian Navy’s (RAN) second air warfare destroyer, HMAS Brisbane (DDG 42), was officially commissioned during a ceremony at the Garden Island Naval Base in Sydney, on October 27. The HMAS Brisbane is the second of three 7,000-ton Hobart-class guided-missile (air warfare) destroyers, based on the Navantia-designed Álvaro de Bazán-class frigate (aka F-100), to be commissioned into service. The first-of-class air warfare destroyer HMAS Hobart was commissioned in September 2017. The Hobart-class program aims to gradually replace the RAN’s aging fleet of six Adelaide-class guided-missile frigates, three of which remain in service. The keel of Brisbane was laid down in February 2014. The ship was launched in December 2016. The Hobart-class is the first class of Australian surface combatants to be built around the U.S.-made Aegis combat system, “an integrated naval weapons system consisting of advanced radar and computer technologies linked to various missile systems with the capability to attack and defend against land targets, submarines, and surface warships,” as I wrote elsewhere. As part the Aegis combat system, the Brisbane is equipped with one of most technologically advanced phased-array radar systems currently in service worldwide, the AN/SPY-1. The radar system is linked with the Brisbane’s main weapon, the 48-cell MK 41 Vertical Launching System, capable of firing Raytheon’s Standard Missile-2 medium-range Block IIIA (SM-2MR Block IIIA) and SM-2MR Block IIIB long-range surface-to-air missiles, as well as the RIM-162 Evolved Sea Sparrow Missile. Additionally, the Hobart-class will also be one of the first classes of warships outside the U.S. Navy to operate the so-called cooperative engagement capability (CEC), which was successfully tested for the first time by the Brisbane and its sister ship Hobart earlier this year. The Brisbane’s sister ship, the future HMAS Sydney, the final guided-missile destroyer of the Hobart-class, is slated for delivery in March 2020. The Sydney was launched in May 2018.